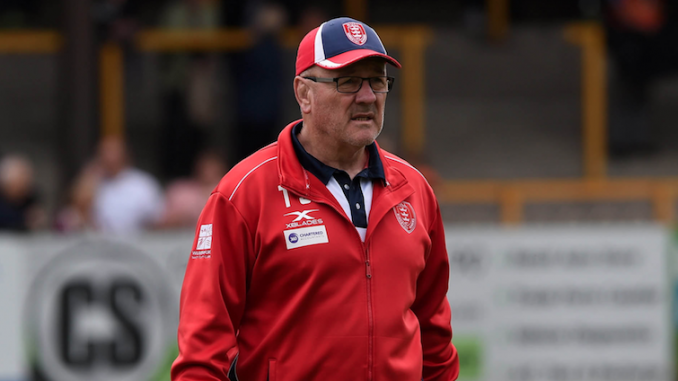 Hull KR coach Tim Sheens has confirmed captain Joel Tomkins is in hospital after suffering concussion in a collision with Blake Austin. The Robins lost 28-14 to Warrington Wolves at the Halliwell Jones Stadium on Saturday afternoon. Hull KR skipper Tomkins left the field midway through the first half after receiving a bang to the head in a challenge from Blake Austin, which the Warrington half-back was sin-binned for. “He is in hospital in a bad way from what I’m told so we are a bit concerned about Joel in that regard,” Sheens said. “I haven’t seen the incident. I was told Austin hit him on the ground, and Joel is in hospital at the moment because he is sick. “It’s a tough one for referees because they didn’t know he hit him that hard that he put him in hospital. It doesn’t matter if you are in hit on the ground or whether you are running through – if you are hit on the head then you are going to have a problem. Sheens revealed that he was happy with his side’s start to the season, with the Robins beating rivals Hull FC last week and running Warrington close. “I’m relatively happy with our start to the season but we have got to work hard this week to turn this loss around and look for a second win rather than a second loss,” Sheens added. “I’ve already said to the players that we’ve got to turn up this week and make sure we build on where we are going. “Warrington are rated to be Grand Finalists this year, so we can hold are heads up going home and say that we’ll be better prepared for the next time we play them. Sheens revealed that Junior Vaivai suffered a minor concussion, while Chris Atkin picked up a bump to the shoulder.